Age: It went live on October 1st 1999, making it over 18 years, 6 months old. The site has about 211 users daily, viewing on average 2.60 pages each. 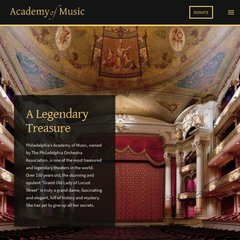 The Philadelphia Orchestra Association (Pennsylvania, Philadelphia) is the location of the Apache/2 server. Academyofmusic.org's IP address is 204.75.178.47. Its 5 DNS Records include, dns3.uslec.net, dns4.uslec.net, and dns5.uslec.net.